Most of those in attendance came in the first half hour of the session, when 61 persons had signed their names to a sheet at a table at the front of the room. By the time the posters were taken down at 8 p.m., 68 names were on the sheets, but several people entered the room without signing in. Those in attendance included four of the five members of the Board of Commissioners, at least 10 of the 29 members of the citizen Stakeholders Committee helping with the rewrite of the 2008 Comprehensive Plan, and the three staff members of the Northeast Georgia Regional Commission who organized the meeting. The Thursday night session was billed as a public forum to give citizens in the county a chance to review the work of the Stakeholders Committee that has been completed so far. Another public forum will be held later in the year, when the draft of the revised plan is to be finished and presented to the Board of Commissioners for final action. The 2008 Comprehensive Plan consisted of three volumes: The Community Agenda, Community Assessment Volume 1 (Issues and Opportunities), and Community Assessment Volume II (Technical Analysis). A central part of The Community Agenda–and the Comprehensive Plan itself–is the Future Development Map that is designed to be used by the Board of Commissioners to guide decisions about the location of future development in the county. As visitors entered the room on Thursday night they were confronted with the first of the five posters–a large map of Oconee County. Visitors were encouraged to put a pin on the map indicating where they lived. Another poster summarized the results of an opt-in, or volunteer, survey of residents of the county who knew about the survey and participated earlier in the year. Respondents had the ability to respond more than once. 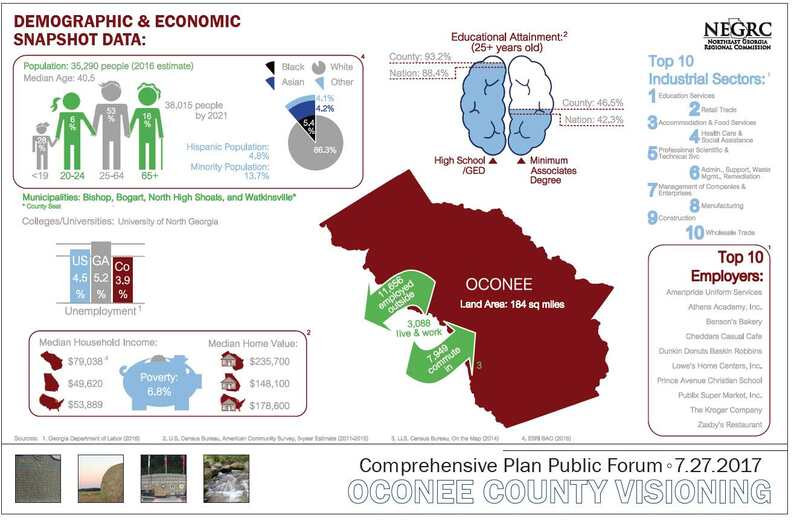 A third poster summarized some demographic and economic data for the county. A two-poster station included the proposed revisions to the Future Development Map and a story board indicating the importance of the Map for the county. That station attracted the most attention during the evening. Those who attended the meeting on Thursday were given the opportunity to post notes on the posters and to complete and submit a form with comments. They also could give their feedback to Justin Crighton, the planner at the Northeast Georgia Regional Commission who is taking the lead in updating the Comprehensive Plan, and NEGRC project specialists Eva Kennedy and Jordan Shoemaker. Crighton told me on Friday that he and his staff were compiling the feedback they received for the future use of the Stakeholders Committee. Crighton was at the Future Development Map station for most of the evening, while Kennedy explained the poster summarizing the survey responses. Shoemaker greeted those who entered the room for most of the evening. Crighton and his staff also have created a second online survey for citizen who wish to do to complete. As with the earlier survey, there is no prohibition against participating more than once, though the expectation is that citizens will not do that. B.R. White and Sandy Weinel, director and assistant director of the Oconee County Planning and Code Enforcement Department, also attended the meeting and met with citizens as the evening progress. They are serving as resource staff for the Stakeholders Committee. I have created a video of just less than 10 minutes in length from the meeting on Thursday night to provide an overview of the gathering. That video is below. The video consists of a series of clips taken as the even progressed. Most of those clips were shot in the first hour, when more people were in attendance. The clips are presented in the order I shot them as the evening progressed. I have zoomed in on some of the notes people pasted to the poster boards to give some sense of the feedback provided. 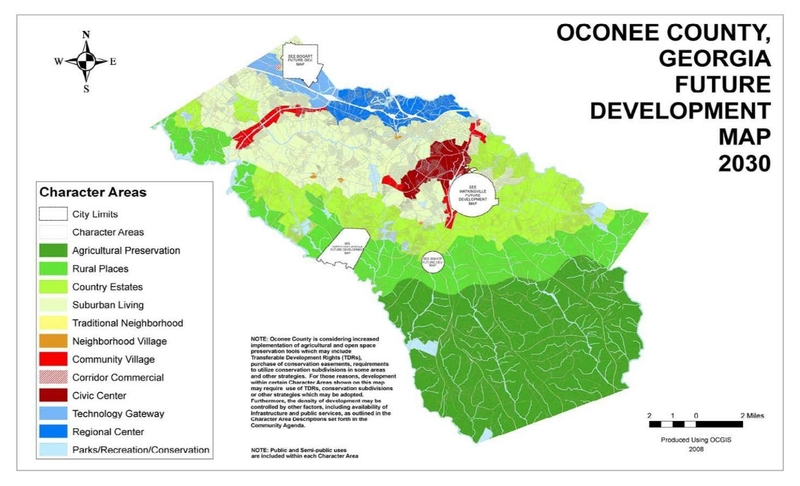 Videos from meetings of the Stakeholders Committee back through February, when the group began its work, are available on a Comprehensive Plan Channel of the Oconee County Observations Vimeo site. It is possible to click on the images embedded in the post above to enlarge them. Right-click on the image to download it. OCO: Comprehensive Plan Public Forum 7 27 17 from Lee Becker on Vimeo. Ten of twenty-nine of the Stakeholders' Committee deigned to show up. The member at the survey poster was unsure of the numbers making up the cohort whereof the "statistics" were obtained. The cool colorized map of SUGGESTED future planning was interesting. The area planned to remain rural sure has been reduced south. 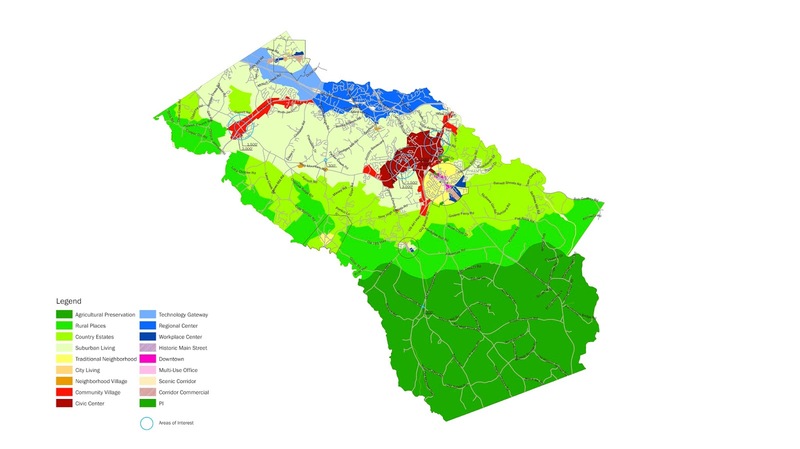 The County is at a decision point. Resistance to commercializing may be futile. I attended meeting and talked to Mr. J.C. The new map is very similar to the last map, preserving much of the south end of the county for agriculture as it currently is. There are only a few changes, increasing nodal development in mainly the north end. I was disappointed that no other areas in which stakeholder committee is working, had any drafts available for comments. I don't think the stakeholder committee members were encouraged to come, although I guess they could have talked us, the public, if they were identified as such. As I said in the post on July 26, Crighton told Stakeholder Committee members they were not required to attend. I counted 10 who did, but I could have missed some. As you note, they were not designated as members of the Committee. I am also a Committee member. I have attended general meetings and most of the subcommittee meetings, as assigned. Through the entire process members have discussed, questioned and suggested means of making our community a better place. Folks attending the public meeting were encouraged to add comments to map and fill out the survey. People were exchanging ideas and thoughts about the maps-so, yes, I spoke with folks.